On June 15 and 16th, my husband and I conducted a workshop in Pembroke, Ill. Last year, we did a two-week journalism workshop in Pembroke and established the iWriteADream journalism program. The workshop this year taught 5th-8th grade students how to do research and produce a powerpoint presentation. For their research topic, we chose "From the Maafa to the Presidency: A Change Has Come. " Students researched African-American history from the Middle Passage in which millions of Africans died while being transported from their homeland to slavery (Maafa is derived from the Swahili term for disaster) to the election of the first African-American president. While preparing for the workshop, we collected photos. 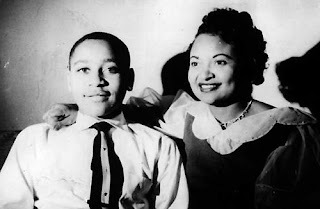 Some of those photos were of Emmitt Till and his mother, Mamie Till Mobley. Emmitt's death was noted as one of the leading events that motivated the American Civil Rights Movement. Emmitt was 14 years old when his mother sent him to visit relatives in Mississippi. He was brutally murdered after he allegedly whistled at a white woman in a store. His mother courageously chose to have his casket open during his funeral so that the world could see the face of racial hatred. Seeing those photos and recalling the struggle and the strength of my ancestors inspired this poem. To read more about Mamie Till-Mobley, read her biography, "Death of Innocence: The Story of the Hate Crime that Changed America" written by Till-Mobley and Christopher Benson. To see some of the work done by Pembroke students in the iWriteaDream Writing Workshop in Pembroke, click here.